Inman Park Dine Out - This Wednesday! 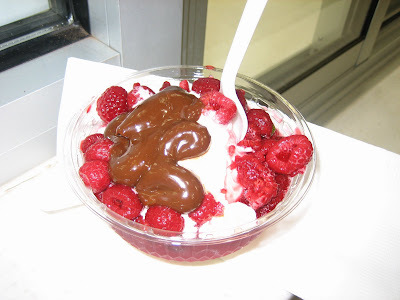 The Razzle Dazzle - vanilla custard with raspberries and hot fudge - this one was mine! 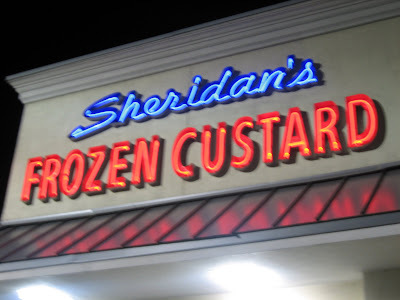 Sheridan's Frozen Custard in Tucker is definitely worth checking out. 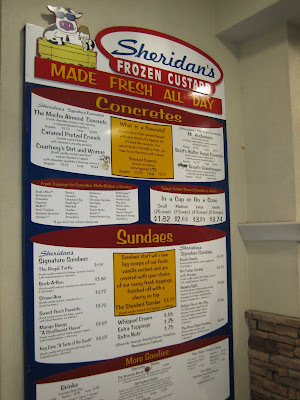 They have various sundaes, smoothies and specials as well as their signature "concretes", which consist of frozen custard with various toppings or flavors blended in. We first tried this place in Memphis last summer and loved it - come to find out there's another one much closer to home! 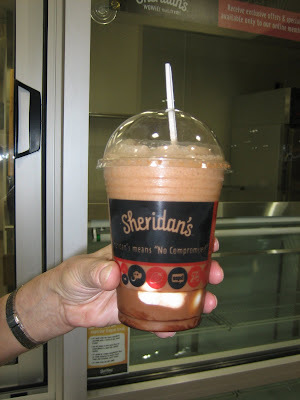 Chocolate ice cream soda - mom's favorite. Steve tried the mocha almond concrete (left)... he later had to supplement with a cone of chocolate custard (not pictured!). 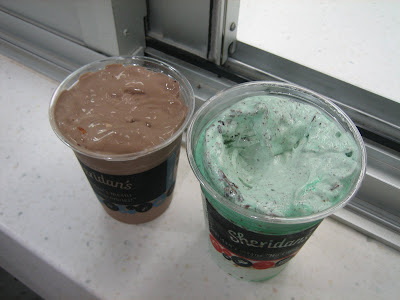 Calvin went for Grant's Grasshopper (right) - vanilla custard blended with mint, chocolate chips and Oreo cookies. 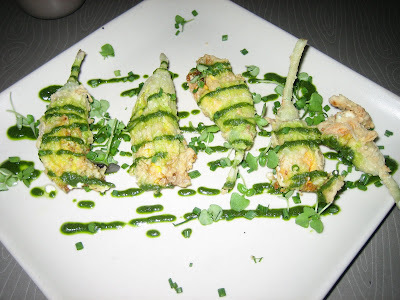 Crispy squash blossoms with ricotta and basil. While my mom and stepfather were in town we ate very well! 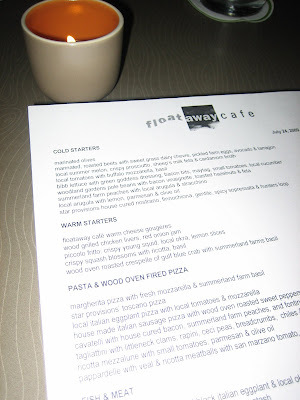 On Friday night just after they arrived we headed over to Floataway Cafe, located on Zonolite Road near where Briarcliff Rd. intersects with Johnson Rd. Living so close to this location, I cannot believe this is my first time here. 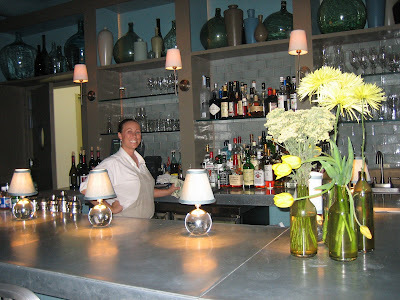 I love the space, which has apparently expanded since their original opening. There are two dining room areas and a large bar area. We had a wonderful meal. 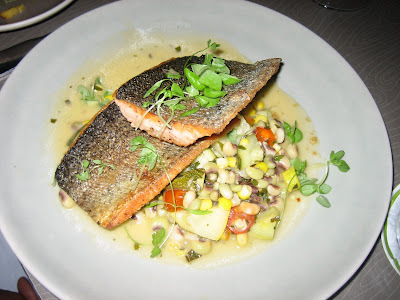 My favorites were the squash blossoms, the quail, the trout and the toffee pudding cake - delicious. 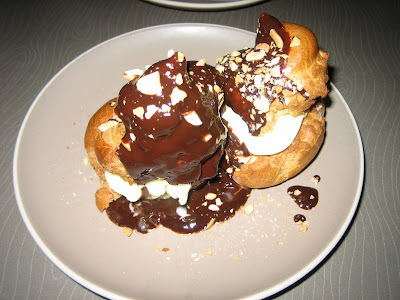 You should definitely give this place a try! 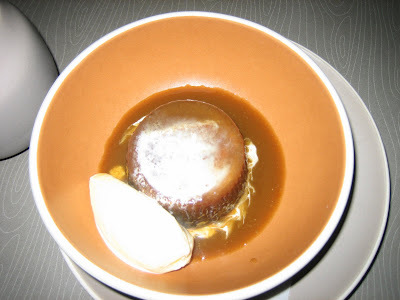 The desserts were all wonderful but our favorite was the toffee pudding cake with vanilla ice cream. With just the right amount of sticky sweet mixed with cool, fresh ice cream, this one really impressed us and had us licking the spoon for more! 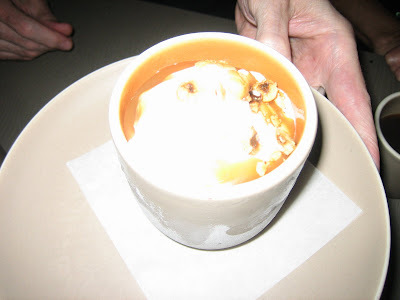 Soft serve ice cream with caramel and hazelnuts. Toffee pudding cake with ice cream - table favorite! 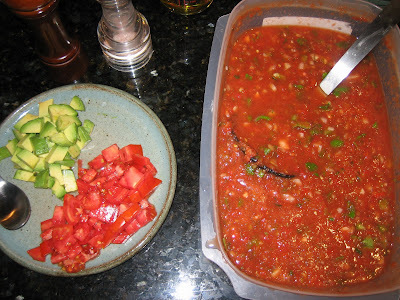 Gazpacho with avocado and tomato to sprinkle on top. Last week I decided to make homemade gazpacho for my UUCA covenant group. Luckily I got tomatoes in my CSA last week so it worked out perfectly! 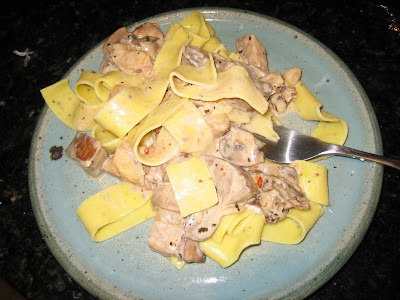 I looked at several recipes before making it, but I really just threw ingredients together in the blender and continued adding spices, salt and pepper until I liked the taste. I used habenero hot sauce as well as sherry wine vinegar to add to the spice. For serving, my guests poured olive oil over the soup and sprinkled in diced avocado and tomato. Everyone brought something to share so we also had great cheese and bread, potato salad, sangria and blueberry cobbler. Yum! 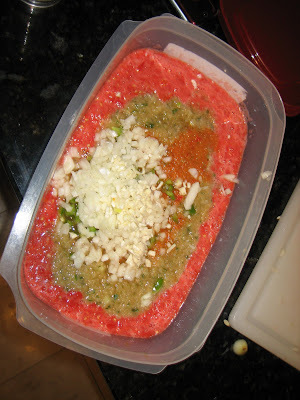 I would definitely make this gazpacho again. Finally, a photo of the pie we liked the best at Shorty's, as described back in April here. We got takeout from Shorty's last week and thoroughly enjoyed this pizza again, along with a nice Caesar salad with lots of anchovies. I'm not a huge anchovy fan, but they worked in this salad for sure. If you haven't tried Shorty's, it's a definite stop for good pizza-eating! Admission includes a sampling of four food items from the new Mr. C’s Bar Menu and, for guests 21 years and older, one of three signature cocktails (Blackberry Lemonade, the Italian Lemon Drop or Blackberry Fields Martini) or another drink on the Mr. C’s list. 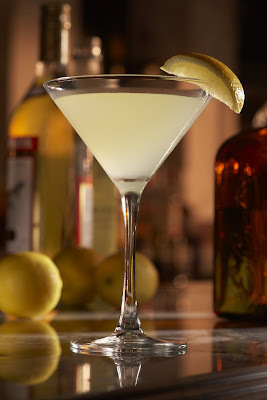 In addition to monies raised from event admission, Carrabba’s also will donate $1 to MDA for each of the three signature drinks sold from July 30 – August 6. 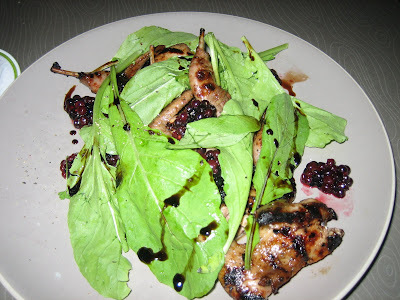 Garnish with a blackberry and mint leaf on a cocktail pick. Build in a highball glass. Stir and garnish with a blackberry and lemon wedge on a cocktail pick. Inman Park Dine Out will take place Wednesday, July 29. Participating restaurants and businesses will donate a portion of the day's sales to the Inman Park Security Patrol fund. Other specials, discounts and promotions will be offered as well. There will even be a Jake's Ice Cream flavor developed just for Inman Park! Below are the participating businesses. 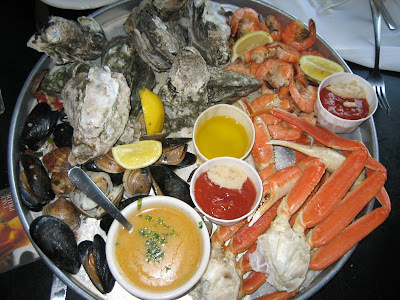 Hot combo platter with mussels, clams, crab legs, shrimp & oysters. 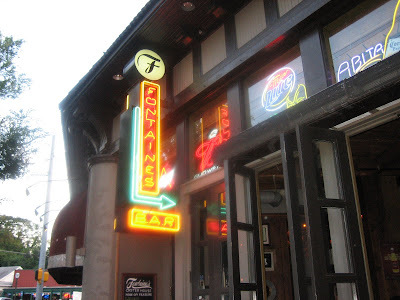 Last weekend I was invited to a complimentary meal at Fontaine's Oyster House, a restaurant I've walked past many times but had never tried before. As I'm not really into the bar scene, I was pleased that they offer patio seating on the long, communal patio shared with several nearby restaurants. For those who do like a lively bar scene, this is definitely a great choice. The scene at the VaHi corner. 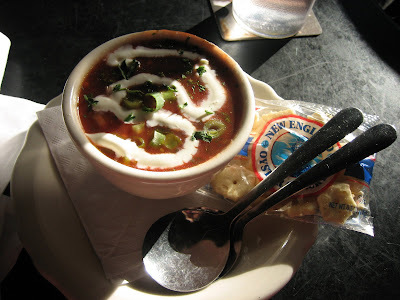 Soup of the day - gazpacho. We started with a cup of the gazpacho, which had good tomato flavor but could have used more spicing, in my opinion (cilantro, hot sauce etc.). 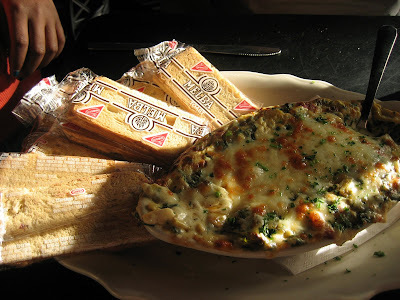 Next we tried the spinach artichoke dip, which was tasty, cheesy and creamy - everything one expects from a good dip. The melba toast crackers served with the dip were a surprise. I love melba toast but I think toasted pita points or bread would work better with the dip. Spinach artichoke dip with melba toast crackers. The highlight of the meal was the hot sampler platter pictured above: a huge plate (really, we could barely fit it on our table with everything else!) 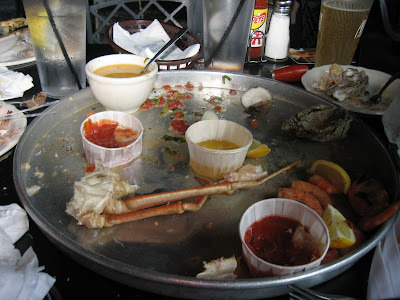 with tasty oysters, clams, mussels (we chose the white sauce, which was very tasty and buttery), snow crab legs and steamed shrimp. I loved it all and it was fun cracking the shells ourselves with the provided tools. 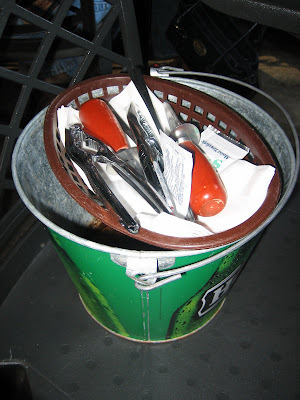 The hot dog basket we ordered to round out our selection also pleased the palate, with a huge, juicy beef dog, cut in half to make chewing easier. 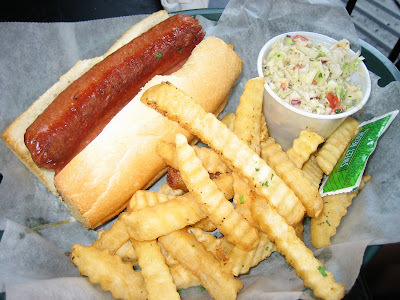 The slaw served with the dog was simple, yet tasty. I was glad it did not contain too much mayo. 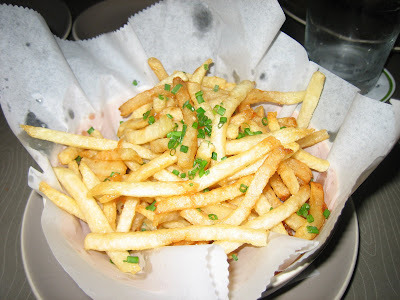 The crinkle cut fries, fresh out of the fryer, were also addictive. We ate the whole thing! For dessert we tried the two options they offered: chocolate icebox pie and a coconut-topped cake with white chocolate ganache filling and lemony cake layers. The coconut cake was the biggest hit - I couldn't believe we ate the whole thing! I would definitely recommend Fontaine's to anyone looking for great seafood at a good price. 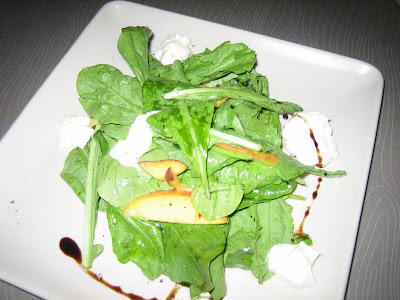 The service was very attentive and I really enjoyed dining outdoors on the patio. 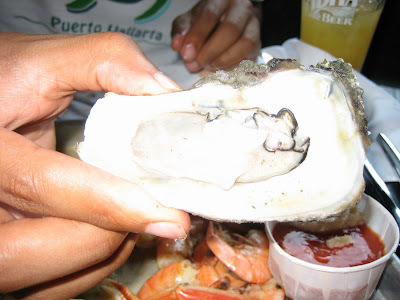 They also have some good "happy hour" seafood specials (see website). I look forward to returning soon to try some additional menu items. 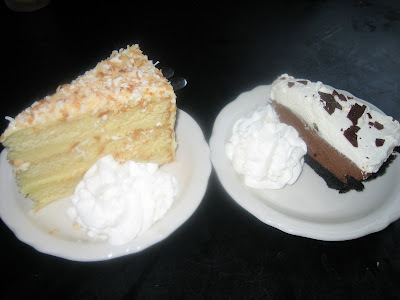 White chocolate lemon coconut cake and chocolate icebox pie. 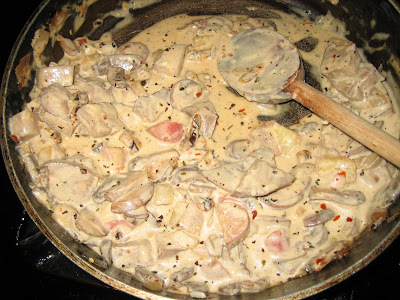 Trader Joe's Lemon Pepper pasta with spicy mushroom eggplant sour cream sauce. I started out thinking I would make a stir-fry. Then I remembered I had Trader Joe's lemon pepper pappardelle so I decided to make an olive oil sauce. After sauteing the mushrooms, eggplant, onion and garlic and adding spices, butter and olive oil, the dish looked like it would be so good with some cream. While I didn't have any regular heavy cream, I noticed there was a small container of sour cream left over from our last nacho-fest. Hmmm... will this work?! I started off adding just a bit of sour cream and after tasting it to ensure that it wasn't ruining the dish, I added in the rest (probably about 1/2 cup total). This turned out to be a great dish, mostly because of the sour cream and the terrific pasta - another winner from TJ's. 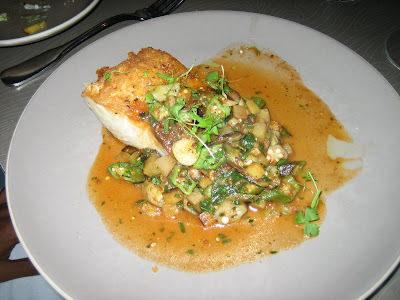 After hearing the hype, reading the blogs and wondering about Varasano's for a long time, I ventured to try it last week with Malika from Atlanta Restaurant Blog. 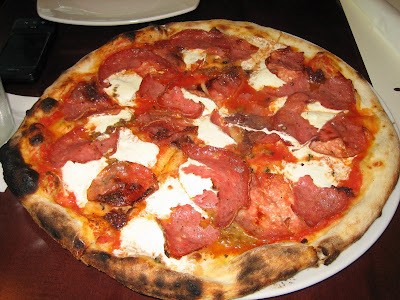 We tried the salumi (pictured above) and the white clam pizza. The salumi was tasty, with good fresh mozzarella and Italian meats. The char on the pizza gave it flavor and body as well, but to be honest, I was not that impressed. 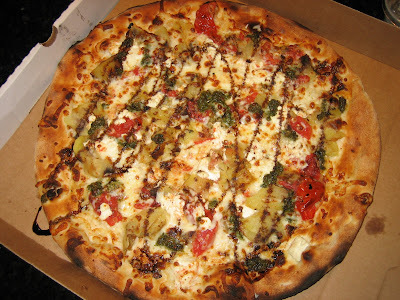 There are lots of good pizza places in Atlanta, and while I would return to Varasano's, I'm not dying to go back. 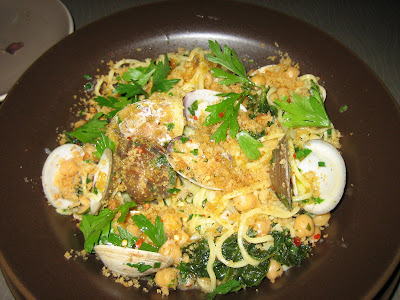 The clam pizza was very garlicky and did not taste like pizza to me (although I LOVE garlic). It wasn't bad, but I think it should be advertised as clam bread or something other than pizza. To be fair, I've only tried these two pies, so I would definitely like to try more in the future - I'm especially intrigued by the dolce pizza (dates and fontina cheese with honey), which I've heard is more like dessert than a main course. 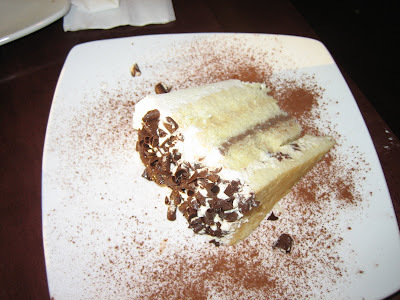 If you mention facebook during the month of July you will get a free slice of cake - and the cake was good, with Italian liqueur in it! Readers, what do you think of Varasano's? What is your favorite pizza place in the Atlanta area? Last night I had the privilege to attend the Taste & Tour of Cheshire Bridge event, which continues through Thursday evening. Not only did I sample some wonderful foods, register for some great prizes and learn more about my own neighborhood, but I met some new friends also. Another plus: proceeds go to benefit Project Open Hand. Even though I live within walking distance from all of these places, somehow (even with all the eating out I do), I had never been to several of these restaurants and businesses. Among the samples: sushi rolls, sangria, baklava, pasta with meatballs, cookies, pad thai, ginger snapper, injera with several Ethiopian dishes. We did not get to all of the restaurants as we ran out of time and we were so full! You should definitely check this out - it's a great event. 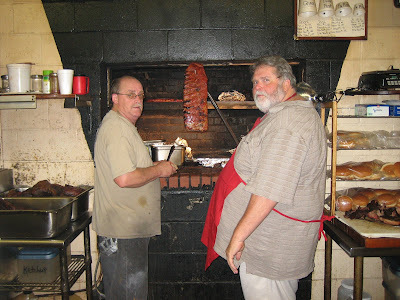 The owner, "Big Daddy", holding up a rack of ribs. Finding myself in Columbus, Georgia for work two days last week, I researched a good lunch place. 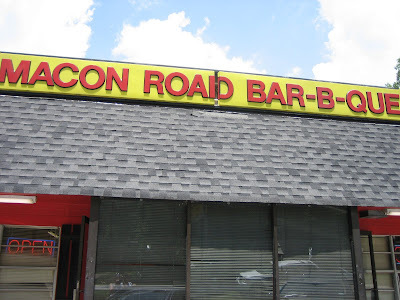 My paralegal and I enjoyed a down-home barbecue lunch at Macon Road BBQ, where we sampled the "chipped" (similar to pulled, but chopped finer) pork and side dishes. The decor, or lack thereof, is about what you'd expect from looking at the worn exterior of this place, but everything tasted great, including their Brunswick stew, which we also sampled. I liked the slightly mustardy, thin sauce served on the side at every table. I even drank sweet tea - having unsweetened tea in a place like this is just a shame! This is definitely a good option if you're in the Columbus area and need an authentic southern BBQ meal. 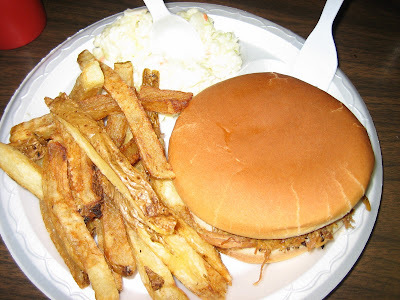 Chipped pork andwich platter with slaw and fries. With friends in town we decided to try the newly renovated Highland Bakery for Sunday brunch. This is one of my favorite places (along with West Egg Cafe) for brunch in Atlanta (see my previous post here). The new space shows off a much larger bakery with breads, pastries, cakes and more. Samples of bread were available, making the short wait pleasant indeed. Perhaps the new space has something to do with the wait being shorter as well, which is a major plug for this place as West Egg can be downright impossible to get into in less than an hour on the weekends. 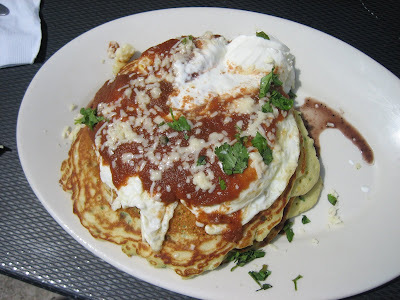 With several people, we tried a variety of dishes including the above-pictured corncakes, which were tasty, but not as flavorful as I expected. 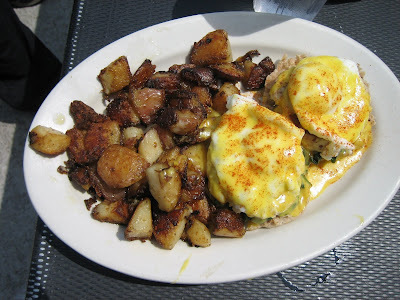 The crabcake benedict, on the other hand, tasted great, with just the right amount of seasoning. The accompanying potatoes were also solid, especially when dressed with Calvin's favorite addition (sour cream!) For some reason I was more in the mood for lunch, so lucky for me, there is a full line of sandwiches and salads along with the brunch items. I tried the Caprese sandwich (below), which was tasty, although a bit more oil and balsamic (yes, I know about the balsamic debate re: Caprese salads, but on a sandwich I'm a fan of including it to moisten the bread and create a flavor contrast) would have been appreciated. We had to try the grits pie after seeing it in the pastry case while we waited. It tasted like pecan pie without the pecans and really didn't taste much like grits - oh well, we liked it anyway and the key lime pie was tasty too. Service was noteworthy, especially because it was so busy and because we sat outside, which I imagine could be a problem sometimes. It did take a few minutes for our food to arrive but our waitress was extremely accommodating and pleasant for the entire visit. Way to go! 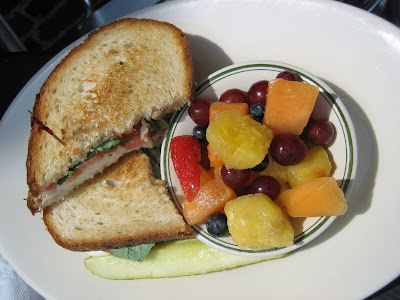 Caprese Sandwich with fruit salad. 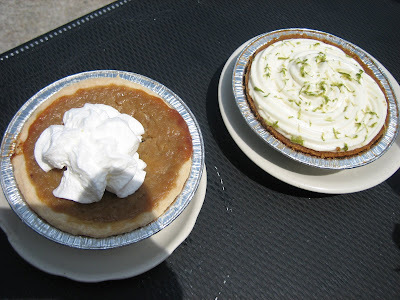 Grits Pie (left) and Key Lime Pie. 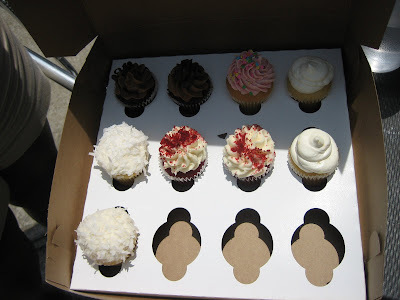 Mini-cupcakes one of our guests bought to take home.